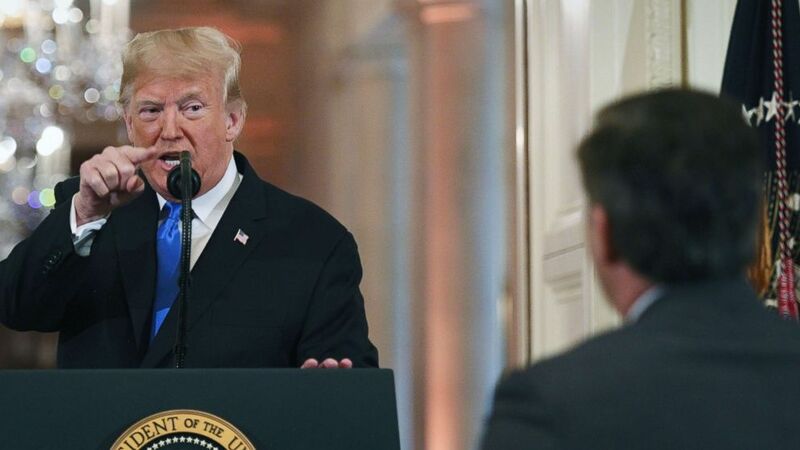 The White House has suspended press access for CNN correspondent Jim Acosta after he and President Trump engaged in a heated exchange during a press conference on Wednesday, one day after the midterm elections. Add White House as an interest to stay up to date on the latest White House news, video, and analysis from ABC News. Acosta tweeted that the Secret Service barred him from entering White House grounds to shoot his 8 p.m. news broadcast. A video posted by Acosta on Twitter also shows that his credentials were confiscated. The Secret Service agent could be heard on camera saying he “was just told to do it” and takes Acosta’s ID out of his lanyard. The White House said in a statement that the reason Acosta was banned from the grounds is because he placed “his hands on” a White House intern during the press conference in the East Wing earlier in the day. President Donald Trump points to a journalist during a post-election press conference in the East Room of the White House in Washington, Nov. 7, 2018. The testy back-and-forth began as Acosta attempted to ask Trump a question about the Russia investigation. “Honestly, I think you should let me run the country, you run CNN, and if you did it well, your ratings would be much better,” Trump told Acosta. After Trump said, “That’s enough,” a White House intern tried to grab the microphone from Acosta. 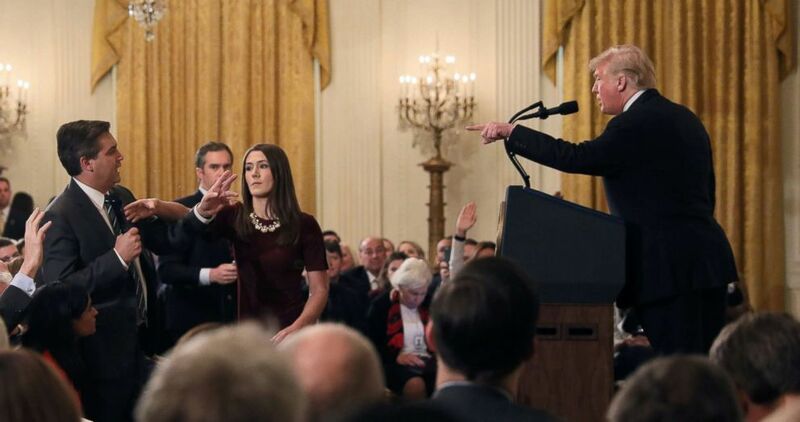 As Acosta kept a firm grip of the microphone with his right hand, his left hand briefly came in contact with the inside of the woman’s elbow as she reached over to grab it, video from the press conference shows. “Pardon me, ma’am,” Acosta told the intern during the encounter, before asking Trump if he was “concerned” that he may be indicted in the Russia investigation. 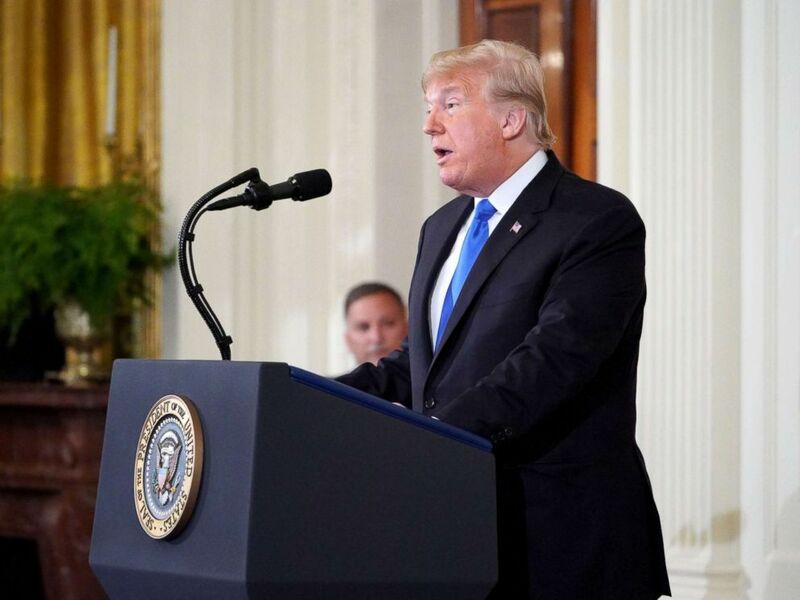 Visibly frustrated, Trump walked away from the podium for a few seconds before returning to admonish Acosta. 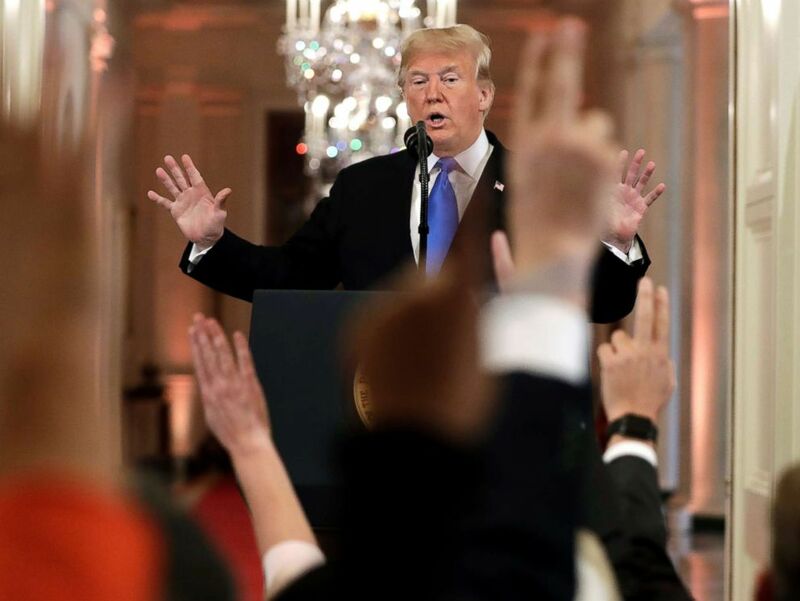 President Donald Trump reacts as reporters raise their hands to ask questions during a news conference in the East Room of the White House, Nov. 7, 2018, in Washington. Sanders also defended Trump, saying he has “given the press more access than any President in history,” and scolded CNN for being “proud” of Acosta. “Contrary to CNN’s assertions, there is no greater demonstration of the President’s support for a free press than the event he held today,” Sanders said in a statement. President Donald Trump speaks during a post-election press conference in the East Room of the White House in Washington, Nov. 7, 2018. Other White House correspondents who were in the room also came to Acosta’s defense. When Trump turned to NBC News correspondent Peter Alexander, telling him, “Go ahead, Peter, go ahead,” Alexander didn’t hesitate to compliment his colleague. “Well, I’m not a big fan of yours either, to be honest,” Trump replied to Alexander. Trump @PressSec confirms that White House has suspended the hard pass of a reporter because it doesn’t like the way he does his job. This is something I’ve never seen since I started covering the White House in 1996. Other presidents did not fear tough questioning. New York Times White House correspondent Maggie Haberman recounted what she witnessed in the room, saying, “This was plain to see he was headed this way for a long time,” after Trump’s team would hand-pick which reporters could travel in their pool while campaigning for the 2016 election.